A Puzzling Present is a very interesting experiment in game design. 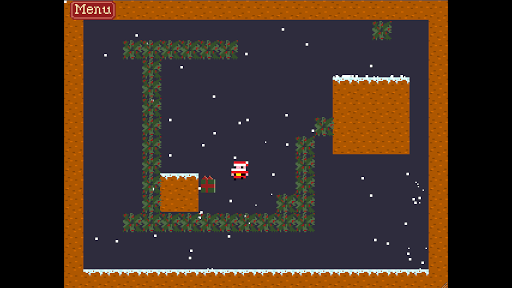 The premise is simple: get Santa to the present on a variety of different challenging platforming screens. But there is a unique twist. 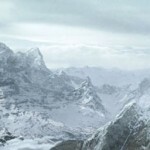 The game levels and challenges are created not by a human designer, but by an AI algorithm. Her name is ANGELINA, and she is a PhD research project from Imperial College in London. She’ll create a brand new game for any player who downloads the app, deciding on what obstacles Santa will face, and what powers he’ll have to overcome them. After the interview I did earlier on the console that will supposedly create its own games, A Puzzling Present will give you some insight into what procedurally generated game creation actually looks like in 2012. To be honest, I agree with the reviewers that say it’s a great experiment, but it didn’t make for a great game. I got frustrated with A Puzzling Present pretty early on because ANGELINA chose a super-power for my Santa that was really difficult to control. But the app is free, and downloading it helps game research. So maybe you’ll have better luck! 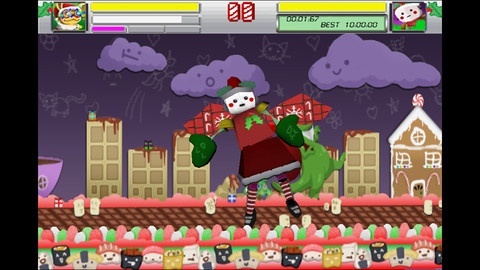 This year also brings us a Christmas Edition of Cute Robot Destruction! This is a new version of a game I covered earlier in the year. Since it’s made by friends and former students of mine, I have a bit of bias about it. But after full disclosure, I’m quite fond of this version of the game, which is a more-polished, Christmassy, extra-cute take on the original. The premise here: tap robots to destroy them! Tap fast to shoot down missiles, or hold out for a charge shot. A new twist: fully charged shots look like Christmas ornaments. There’s something inherently entertaining about lobbing a heavy ball marked “Joy” at a deadly attack penguin. A robot can take a long time to take out, so you’ll want to set aside a few minutes, especially early on if you’re still learning the robot boss patterns. 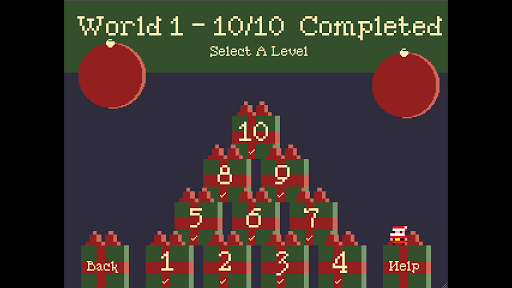 Overall it’s an adorable free holiday distraction worth checking out. Oh, and it happens to be on iPhone, too, if you have one of those. Have a wonderful holiday… and if you can find the time, play lots of games! Thanks for reminding me about Cute Robot Destruction!, there are so many Android games that I’ve forgotten about and since getting my Nexus 7 I’ve been trying to remember as many possible. A Puzzling Present sounds interesting and I’ve heard of ANGELINA before somewhere. It might feel a bit weird playing it this long after Christmas but… well, it’s only going to get longer from here! Also, I hope everyone’s been having a nice break, presuming you all got one!